To Cite: Yousof Boroujerdi R, Azizi M, Hayat A A, Abedini Baltork M. Investigation of Preferential Factors of Users of Online Learning Systems for Ease of Learning, Interdiscip J Virtual Learn Med Sci. 2018 ; 9(1):e61310. doi: 10.5812/ijvlms.61310. Methods: The research was a survey. The studied population consisted of all students of virtual University of Hadith Science during year 2016, which included 200 individuals and the sample size, based on the Cochrane formula, was 132. Considering the fields of study, stratified random sampling proportional to size was used. According to the number of courses and students in each course, samples were selected randomly using the random number table. Finally, 122 students cooperated until the end of the data collection process. Lee and Kim’s (2015) standard questionnaire was used for data collection. This questionnaire contains 32 items and includes the following factors, the content variable with 4 indices and 10 questions, the feedback variable with 2 indices and 6 questions, the services variable with 5 indices and 12 questions, and the ease of learning as a dependent variable with 4 questions. Questions 29 to 32 are related to the 3 independent factors. For each item, a 5-point Likert-type scale was used. In this study, the PLS software was used for analysis of data. Results: Results of the study based on the approach of partial least squares indicated that the content of online learning with a coefficient of 0.32 and P = 0.01, online learning feedback with a coefficient of 0.31 and P = 0.01, and online learning services with a coefficient of 0.67 and P = 0.01 had a positive and significant effect on the ease of learning, and respectively predicted 11%, 10%, and 45% of the variance of ease of learning. Conclusions: According to the results, content, feedback, and services of online learning had a positive effect on the ease of learning. Design of a user friendly online learning system causes the users to find working with this system easier and feel less of a cognitive burden. In Iranian higher education within the recent decade, considering challenges, such as increasing demand for higher education and inadequacy of budget, shortage of fulltime academic board and need to remove geographical limitations, online learning and teaching has been seriously under consideration (1). Given that online learning provides content, services, and feedback simultaneously, its implementation and development in any society wishing advancement is necessary; thus, research in this field is unavoidable. Various users have a different perception of online learning systems, which will affect the admission manner and use of online learning systems (2). On the other hand, users due to differences in the experience of working with computers (2) and previous experiences (3), have different tendencies and preferences of features of online learning systems. The studies on online learning have dealt with factors, such as appropriate contents of online learning (4, 5), teaching strategies, including learning control and feedback (6, 7), and technical support (5, 8, 9). According to theoretical fundamentals, 3 groups of factors, including 1, content-related factors; 2, feedback-related factors; and 3, services-related factors may influence the users’ ease of learning. Ease of learning was a dependent variable in this study, and refers to improvement of understandability of training contents by increasing interest and memory, or in other words, the appropriateness of component technology to present information to users (10). The present study aimed at investigating these factors. Content-related factors included selection of content, logical organization of educational content, clarity of educational content, ethical principles, justification, and setting educational content, all of which are effective on the results and output of online learning systems (10). Upon study of educational content in online learning systems, selection of educational content, selection of structure of educational content, clarity and ethics of educational content are analyzed (11). Regarding feedback-related factors, experts have argued about the importance of learning feedback, including direct, quick, and immediate feedback, through enabling the receiver to achieve clearer understanding of messages, which effects the quality of decision (12). The feedback is required for growth and guidance of learners, and will be followed by sense of confidence, improvement of motivation and self-reliance, promotion and development of personal learning, collaboration in facilitation of growth and development, and their feeling of satisfaction. Therefore, feedback, which effects the learners, has been identified as a key strategy in learning and teaching (13). Regarding services-related factors, 5 cases have been analyzed in relation to preferential factors of users in connection to online learning systems services, including the motivation rate of users for learning by online learning systems, information sharing method, support of software, quality of providing information, and selection of technology (10). Use of an information-sharing method and support of software for further facilitation of knowledge transfer process together with less time and costs is very essential and important (14). Perception and understanding of topics is promoted when the information is provided as multimedia (oral, visual, and movie). As a result, the data processing facilitation is made using synergic supplies and accessories of visual and verbal memory systems (15). Technical factors, including status of images, quality of audio data, technology used in teaching process, ease of learning of educational supplies, usefulness of educational data, and flexibility in learners’ responses are preferential factors. Some researches have been performed on this issue, in which preferential factors of users were somewhat different factors and in some cases were similar. Some of these researches are listed below. The feedback factor had different indexes in most researches, yet the service-related factor and the content-related factor was not observed, and this is a new aspect of the current research. Khodadad Hosseiny et al. (16) indicated that the characteristics of teaching personnel and educational materials have a direct positive effect on the intention of use of online learning, through perceived productivity and pleasure. Furthermore, perceived productivity among the available variables has the greatest effect on the intention of use of online learning, whilst design of educational content has not been effective through ease of perceived use. McGrey (17), in a research entitled “evaluation of the quality of online training courses”, identified important factors of online courses. He reminded that in the design of an online curricular program, flexibility, interaction, and collaboration are important factors. Results of the research of Sang (17) also showed that items, such as interaction, design, facilities, feedback, and usability, influence the perception of learners from educational quality of online courses, which is consistent with the results of the current research. In general, parts of these studies confirmed the findings of this study, yet since the indicators in the research were different in different ways, they differed slightly in some cases, although this difference did not mean that the findings of this study were not confirmed, and instead indicated a variety of angles of survey and variety of indicators. As previously discussed, there is a need to change the teaching methods with regards to the speed of technological change in today’s world, thus it is essential for the preferential factors of users to be considered for ease of learning so that the training is effective and productive. Therefore, the present study aimed at investigating the preferential factors of users of online learning systems of University of Hadith Sciences for ease of learning. In this research, 3 groups of factors, including content of online learning, feedback of online learning, and services of online learning were analyzed as factors affecting the ease of learning of learners. This research intended to answer the following questions: Does the content of online learning affect ease of learning? Do the feedbacks of online learning affect ease of learning? Do the services of online learning affect ease of learning? The present research was a correlational study and was applied with respect to the objective. The population of this research consisted of all students of online learning system at the University of Hadith Sciences, including 200 students during year 2016. Regarding the inclusion criteria, firstly, the samples were required to participate in several virtual training courses at the virtual training center. Secondly, the samples had to take part in the courses and would eventually be able to obtain a degree. Thirdly, their training was only in the form of virtual training. The sample size of the present study based on Cochrane formula was equal to 132 persons, and considering fields of study, stratified random sampling proportional to size was used. At first, the courses and number of students in each course was determined. Then, according to the number of courses and students in each courses, samples were selected randomly using the random number table. It is notable that finally 122 students cooperated until the end of the data collection process, this value being equal to 92% of the estimated sample. Lee and Kim’s (10) questionnaire was used for data collection. This questionnaire contained 32 items and included these factors: the e-content, feedback, services and ease of learning as a dependent variable. The content variable had 4 indices and 10 questions, the feedback variable had 2 indices and 6 questions, the services variable had 5 indices and 12 questions and the ease of learning, as a dependent variable, had 4 questions. Questions 29 to 32 were related to the mentioned 3 independent factors. For each item, a 5-point Likert-type scale was used to assess the extent that the respondents agreed with each sentence. The face validity of the questionnaire was confirmed by several experts in Educational Management, who were experienced in teaching. Cronbach’s alpha for this scale was estimated to be equal to 0.89. In this research, the PLS software was used for data analysis. Partial least squares (PLS) analysis is an alternative to OLS regression, canonical correlation, or covariance-based structural equation modeling (SEM) of systems of independent and response variables. The present study aimed at investigating the preferential factors of users of online learning systems of University of Hadith Sciences for ease of learning. According to Table 1, concerning the gender of participants, 36.1% and 63.9% were respectively male and female. As seen in Table 1, 18% had less than 25 years of age, 43.4% were between 26 and 35 years old, 24.6% were between 36 and 45 years old, and 13.9% were over 46 years old. According to Figures 2 and 3, the t value corresponding to each factor loading was higher than its critical value (1.96) at 0.05. As a result, these indicators were required for measurement of their related structures. Diagram 1 indicates the value for the effect of content on ease of learning was equal to 0.32. The effect of feedback on ease of learning was equal to 0.31 and the effect of services on ease of learning was equal to 0.67, which demonstrate that content, feedback, and services had a positive and significant effect on the ease of learning and, respectively, predicted 11%, 10%, and 45% of the ease of learning variance. To investigate the reliability of the model, 2 composite reliability and Cronbach’s alpha criteria were used. The value of these 2 criteria must be higher than 0.70. As observed in Table 3, the measurement model was accepted. To analyze the convergent validity, the average variance extracted (AVE) index was used. The value of this index must be higher than 0.50. According to Table 3, the AVE index is accepted. Analysis of data indicated that the content, feedback, and services had a positive and significant effect on the ease of learning. Design of a user friendly online learning system leads to ease of use and less cognitive load. Thus, the learners’ requirements must be taken into consideration in the design of online learning courses. In addition, quality of learner’s interaction with the computer must be applied in design of online learning systems. Attention to factors, such as distinguishing more important factors from other information, organizing the information so that learners can imagine a unified and integrated wholeness in their mind, establishment of a visual order in presentation of information etc. may help the user friendly design of the online learning system. If the content is logical and clear, modified and motivation-based feedback and online learning services are provided to the audiences with an attractive design and based on their requirements, thus learners would find online learning systems easier and simpler. 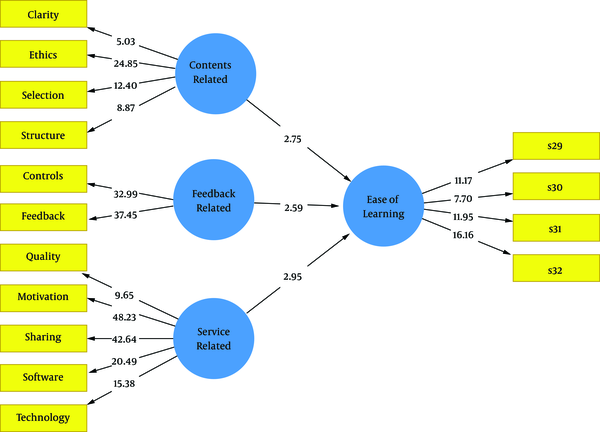 In this research, the importance of learning feedback and control processes in online learning systems was emphasized, and study results were consistent with the results of Lee and Kim (10), Kising (18), Kazemi Mahyari (13), Khodadad Hossieny et al. (16), Kahai and Cooper (19), and Lim et al. (12), which stated about the importance of direct, quick and immediate feedback through enabling clearer understanding of messages. The results of this study confirmed the results of previous studies. Also the study results of Piri, Chen et al. (20), and Lai et al. (21) conformed these research findings, and demonstrated the positive effect of these independent variables on ease of learning. One of the strengths of this research was its community, virtual University of Hadith Sciences, one of the largest and most experienced virtual education centers in the country. Another important strength of this study was that the impact of 3 variables was measured together and simultaneously on ease of learning and its weaknesses were non-generalizable to the rest of the centers. According to what was said, feedback processes have an important role in learning, particularly for learners of online learning courses, because they may be the only opportunity of learners for obtaining information about their performance, and play an important role in their motivation and persuasion. On the other hand, assessment and self-assessment have been identified as the only factors effective on formation of quality of students’ learning in higher education, and quality of learning consequences were dependent on the quality of assessment. One of the major concerns of students in self-assessment was related to feedback. Hence, the effect of effectual and effective feedback is beyond the teaching and learning process, because feedback is required for growth and guidance of learners, and will be followed by sense of confidence, improvement of motivation and self-reliance, promotion and development of personal learning, collaboration in facilitation of growth and development and feeling of satisfaction. Therefore, in the references, the feedback effective on learners was identified as a key strategy in learning and teaching. Five cases were studied in this research in relation to preferential factors of users in connection to online learning system services, including the motivation rate of users for learning by online learning systems, information sharing method, support of software, quality of providing information, and selection of technology. Finally, considering the high importance of online learning, its implementation and development in any society wishing advancement requires investment and focus on this type of learning. The extensive benefits of this type of learning, including learning beyond time and place, economic savings, private education, personal and integrated nature, dynamics and rapidity, has attracted many educational organizations and institutions towards online learning implementation for training their human resources (22, 23). In brief, content, feedback, and services have a positive and significant effect on the ease of learning. The best e-content for distance education requires planning and technical support of professors. Thus, it is suggested that the educational goals of e-content should be considered and defined by the students’ experiences and background. Furthermore, it is recommended for online learning centers of each university to hold efficient workshops and training in the field of ease of learning. Other recommendations include obtaining the right feedback from the users in a friendly atmosphere, online learning services being up to date, high-speed and without complexity, providing ease of use for ease of learning, and finally holding appropriate training for professors in order to empower them to transfer proper online learning content. The authors would like to thank all students of online learning system of University of Hadith Sciences for their participation in the study, and those, who supported this work. Authors’ Contribution: Raziyeh Yousof Boroujerdi and Mostafa Azizi designed the study and conceptualized the framework. Raziyeh Yousof Boroujerdi and Mostafa Azizi carried out the study and collected the data. Mostafa Azizi and Ali Asghar Hayat analyzed the data and contributed to the interpretation of the results. Raziyeh Yousof Boroujerdi and Mostafa Azizi wrote the manuscript with support of Meymanat Abedini Baltork. Ali Asghar Hayat and Meymanat Abedini Baltork supervised the findings and revised the article. Finally, all authors discussed the results and commented on the manuscript and then approved the final version of the manuscript. Conflict of Interest: There were no conflicts of interest to declare. 1. Mahdioun R, Ghahremani M, Farasatkhah M, Abolghasemi M. Quality of learning in academic online learning centers, qualitative study [In Persian]. Bibliog Inf Res Bull Acad. 2011;44(58):77-100. 2. Chrysostomou K, Chen SY, Liu X. Investigation of users’ preferences in interactive multimedia learning systems: a data mining approach. Interactive Learn Environ. 2009;17(2):151-63. doi: 10.1080/10494820801988315. 3. Minetou CG, Chen SY, Liu X. Investigation of the use of navigation tools in web-based learning: A data mining approach. Int J Hum Comput Interact. 2008;24(1):48-67. doi: 10.1080/10447310701771480. 4. Ramos de Melo F, Flôres EL, Diniz de Carvalho S, Gonçalves de Teixeira RA, Batista Loja LF, de Sousa Gomide R. Computational organization of didactic contents for personalized virtual learning environments. Comput Educ. 2014;79:126-37. doi: 10.1016/j.compedu.2014.07.012. 5. Ozkan S, Koseler R. Multi-dimensional students’ evaluation of e-learning systems in the higher education context: An empirical investigation. Comput Educ. 2009;53(4):1285-96. doi: 10.1016/j.compedu.2009.06.011. 6. Buff A. Enjoyment of learning and its personal antecedents: Testing the change–change assumption of the control-value theory of achievement emotions. Learn Individ Differ. 2014;31:21-9. doi: 10.1016/j.lindif.2013.12.007. 7. Coll C, Rochera MJ, de Gispert I. Supporting online collaborative learning in small groups: Teacher feedback on learning content, academic task and social participation. Comput Educ. 2014;75:53-64. doi: 10.1016/j.compedu.2014.01.015. 8. Pedaste M, Sarapuu T. Design principles for support in developing students’ transformative inquiry skills in Web-based learning environments. Interactive Learn Environ. 2012;22(3):309-25. doi: 10.1080/10494820.2011.654346. 9. Schroeder A, Minocha S, Schneider C. The strengths, weaknesses, opportunities and threats of using social software in higher and further education teaching and learning. J Comput Assist Learn. 2010;26(3):159-74. doi: 10.1111/j.1365-2729.2010.00347.x. 10. Lee S, Kim BG. Users' preferential factors in Web-based e-learning systems for ease of workplace learning in Korea. Learn Individ Differ. 2015;39:96-104. doi: 10.1016/j.lindif.2015.03.027. 11. Yang JC, Chen SY. Investigation of learners' perceptions for video summarization and recommendation. Interactive Learn Environ. 2012;20(4):369-85. doi: 10.1080/10494820.2010.486888. 12. Lim KH, O’Connor MJ, Remus WE. The impact of presentation media on decision making: does multimedia improve the effectiveness of feedback?. Inf Manage. 2005;42(2):305-16. doi: 10.1016/j.im.2003.12.012. 13. Kazemi Mahyari H. Role and Importance of Feedback in Online learning, National Conference on Accounting and Management. Conferences Center of Power Research Center. Tehran. 2013. 14. Andres HP. Multimedia, information complexity, and cognitive processing. Inf Resour Manag J. 2004;17(1):63-78. doi: 10.4018/irmj.2004010104. 15. Mayer RE, Moreno R. Aids to computer-based multimedia learning. Learn Inst. 2002;12(1):107-19. doi: 10.1016/s0959-4752(01)00018-4. 16. Khodadad Hoseiny SH, Noori A, Zabihi MR. E-learning acceptance in higher education: Application of flow theory, technology acceptance model & e-service quality. Q J Res Plann High Educ. 2013;19(1):111-36. 17. Mahmoodi Z, Esmaelzadeh SS, Lotfi R, Baradaran Eftekhari M, Akbari Kamrani M, Mehdizadeh Tourzani Z, et al. The evaluation of a virtual education system based on the DeLone and McLean model: A path analysis. F1000Res. 2017;6:1631. doi: 10.12688/f1000research.12278.1. 18. Kising'u TM. "Role of Strategic Leadership for Sustainable Competitive Advantage in Kenyan Public and Private Universities". JKUAT-COHRED; 2017. 19. Kahai SS, Cooper RB. Exploring the core concepts of media richness theory: The impact of cue multiplicity and feedback immediacy on decision quality. J Manag Inf Syst. 2014;20(1):263-99. doi: 10.1080/07421222.2003.11045754. 20. Chen N, Wei C, Huang YC, Kinshuk . The integration of print and digital content for providing learners with constructive feedback using smartphones. Br J Educ Technol. 2013;44(5):837-45. doi: 10.1111/j.1467-8535.2012.01371.x. 21. Lai CL, Hwang GJ, Liang JC, Tsai CC. 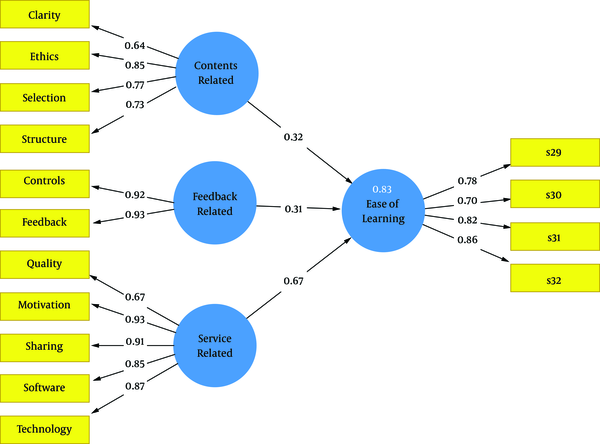 Differences between mobile learning environmental preferences of high school teachers and students in Taiwan: a structural equation model analysis. Educ Technol Res Dev. 2016;64(3):533-54. doi: 10.1007/s11423-016-9432-y. 22. Bazm S. Assessment of E- Learning Providing Status in Yazd Shahid Sadoughi University of Medical Sciences [In Persian]. Biannual J Med Educ Dev Center. 2015;3(1):46-51. 23. Karanjam SS, Zarif Sanaiey N, Karanjam S. Designing a comprehensive organizational e-learning model using the meta-synthesis method. Interdiscip J Virtual Learn Med Sci. 2017;8(3). doi: 10.5812/ijvlms.11496.